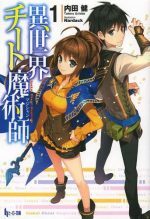 In celebration of nearly a million copies in print, the Isekai light novel series "Isekai Cheat Majutsushi (Magician)" has announced today that the series is going to be getting an anime adaptation.Why would they make this into an anime?!" image="bee-surprised2"] [balloon_speech align="right" text="Omg I am so excited! I have been reading the light novels for a few months now.It was also adapted into a manga version and the third bound volue will be going on sale April 26th.It is written by Ken Uchida and illustrated by Nardack The series got its start as a light novel on the popular "Syosetuka ni Narou" (Shousetsuka ni Narou)." image="mo-starryeyes"] [recommendedPost post_id=217718 url= title= img= widget_title=] [recommendedPost post_id=217950 url= title= img= widget_title=] [recommendedPost post_id=217991 url= title= img= widget_title=] [ad_bottom "mt40"].The 8th bound volume for the Light Novel is planned to go on sale in May. The story is about Rin and Taichi who are high school students and are more or less average.I guess I gotta catch up.However, they have an ability known as "cheat" which allows them to be transported to antoher workd where they are reborn as magicians and begin their adventure. [balloon_speech align="left" text="That is the story!? This sounds like utterly boring garbage.